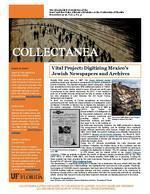 The newsletterâ€™s main aim is to share a collectanea or miscellany of news and stories from the Price Library of Judaica, including the history of its books and collections, features on newly acquired items and upcoming events. Collected for University of Florida's Institutional Repository by the UFIR Self-Submittal tool. Submitted by Rebecca Jefferson. Copyright Rebecca Jefferson. Permission granted to University of Florida to digitize and display this item for non-profit research and educational purposes. Any reuse of this item in excess of fair use or other copyright exemptions requires permission of the copyright holder.